You are told not to drink and drive. Moving from an intemperate climate to a temperate requires adjustments. Dreaming of a White Christmas becomes just that. Santa looks a little silly in a temperate climate but that is what Santas do there. But for some poor souls, habits die hard. This woman loves to cross country ski so every day, rain or shine and no snow she takes her poles and head for a brisk ski through the Jardin and up Recreo. 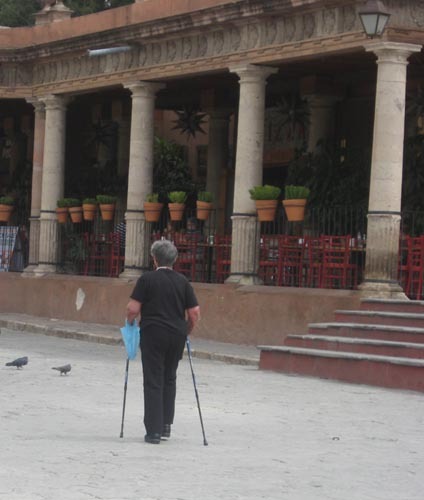 Walking on cobblestones is difficult at best but add age to the equation and it is a challenge. The walking seated tripod is a wonderful invention. Walk a little. Sit a little. Walk a little. Sit a little and ten hours later you are home. But sometimes arts gets in the way of a simple solution just as fashion can get in the way of comfort. Norma once saw a Native Walking Stick. Dump the seating tripod walker and bring me into your life. 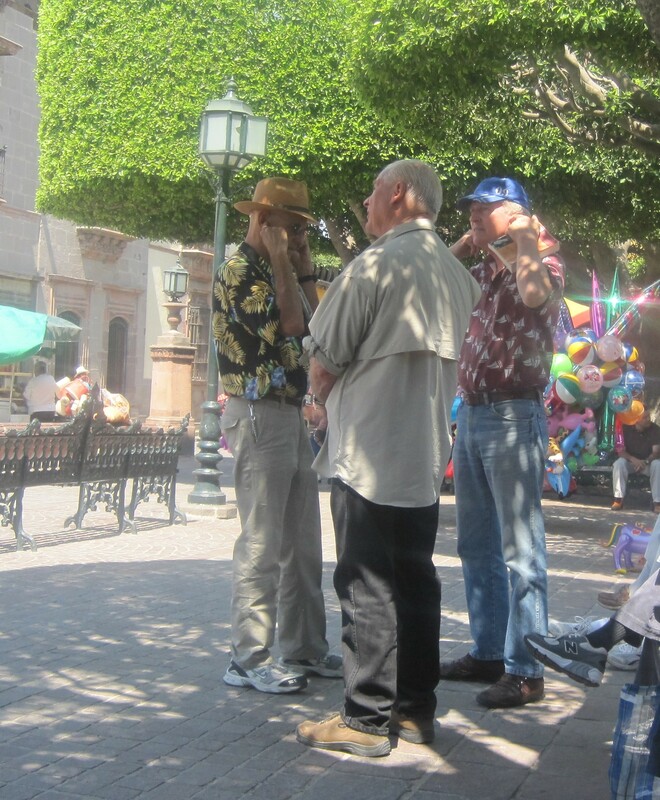 Not all who retire to San Miguel have social security, trust funds, pensions or IRA’s to fund their ‘lifestyles’. 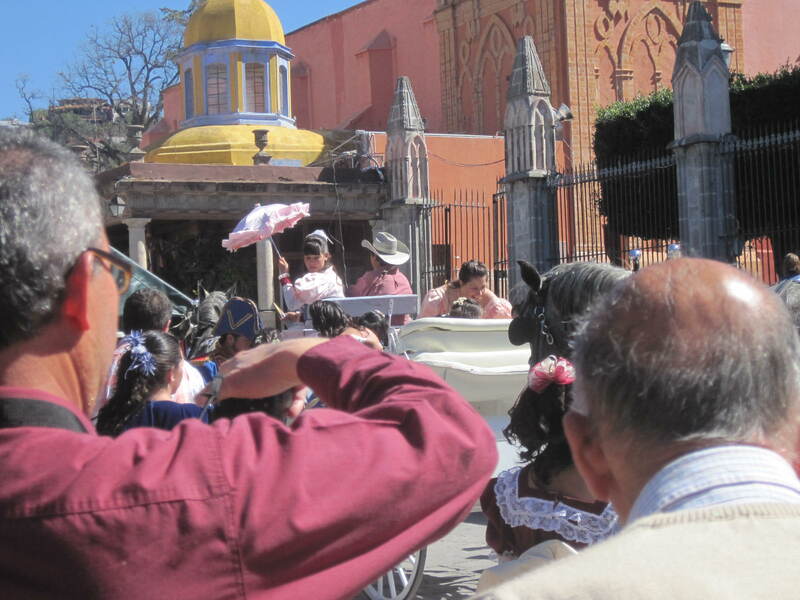 Some who come to San Miguel and must find ways to make a living. 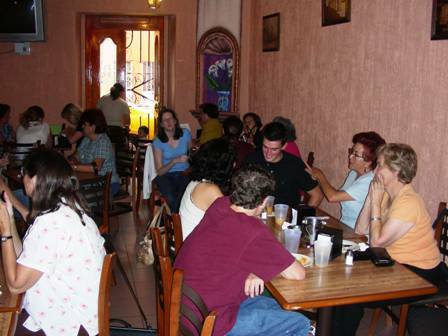 Tom, an entrepreneur has combined art with street food and the appetizer in a truly San Miguel way. Ilona doesn’t look up because, on Wednesday, she tried Dali Guacamole that left her not seeing straight. The Iron Benches of San Miguel fill the Jardin. This the place where men congregate for man talk. One post has already covered the conversation.